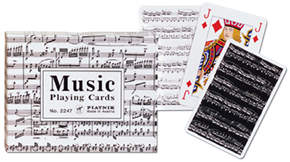 Piatnik issued single decks of Music Playing Cards at some undetermined date, as Item No. 1427. 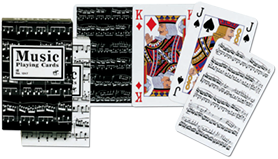 As shown, the cards were available with either black or white backgrounds showing a musical score. What musical score is unknown to us, but it looks like something more than a random collection of notes. 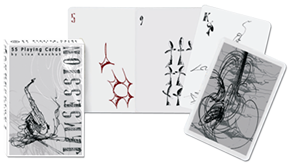 In addition to single decks, Piatnik also issued the two decks (one of each color) in a gift box, Item 2247. 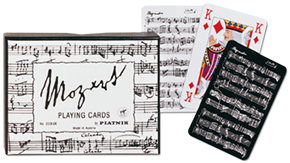 Other related items from Piatnik include the Mozart Black and White double deck, No. 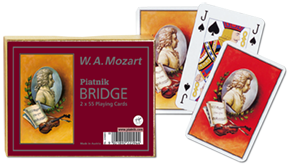 224737, which is not to be confused with the colorful Mozart double bridge deck, No. 220944, and the intriguing single deck entitled Jam Session, No. 119514.